President Trump won’t sign a spending package that includes back pay for federal subcontractors, Republicans told members of the press on Wednesday afternoon. Freedom Caucus chairman Mark Meadows has talked to Trump and says he is confident back pay for federal contractors will *not* be included in the spending bill. Unlike government employees, contract workers weren't guaranteed back pay from the 35-day shutdown. 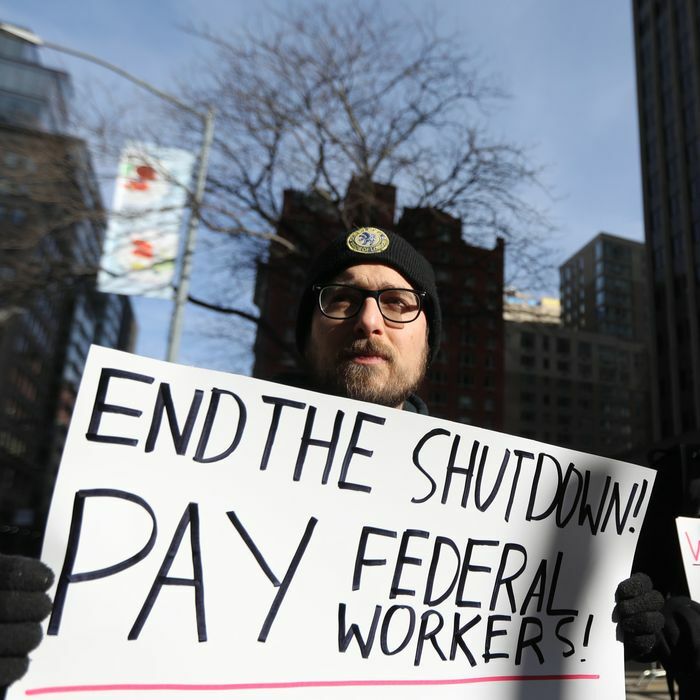 Federal workers are guaranteed back pay after a government shutdown. However, contractors aren’t — a problem Democratic legislators had hoped to rectify. Senator Tina Smith, a Democrat from Minnesota, introduced a bill that would have granted back pay to low-wage contractors affected by the shutdown; Democrats have tried to attach it to a spending package that would avert a second government shutdown on Friday. As the Federal Times explained, during shutdowns companies that hold federal contracts “can pay workers out of company savings, use vacation day donation pools or not pay some of their employees at all for the shutdown period.” During last month’s rollout, Smith noted that federal agencies had already budgeted to pay companies during the shutdown; her bill would direct agencies to pay out that money, which would then go toward workers’ missing wages. The bill does have limitations: It is designed specifically to assist low-wage contractors, and “cap[s] payments at $965 per worker per week, so it would make workers whole only if they earn less than $50,000 annually,” HuffPost reported. That would still be a major help to many contractors, who faced heavy burdens as the shutdown dragged on. Workers missed rent, fell behind on bills, and rationed medicine — and they’ve only had three weeks to pull themselves out of this financial morass. A second shutdown would cause devastation. Smith’s back-pay proposal, though, has garnered opposition not just from Trump but from members of his party. A source told Vox on Wednesday that the office of Senate Majority Leader Mitch McConnell is responsible for some of the pushback, though McConnell’s spokesperson disputed that allegation. 1) Our bill uses a process that has been used 1000s of times to pay contractors. It’s not new & argument that it'd be $$$ to implement is bogus. When Trump ran on his business credentials, perhaps this is what he had in mind. Unions, meanwhile, have trained a spotlight on the issue of contractor pay. On February 16, Unite Here, the American Federation of Teachers, and the Association of Flight Attendants-CWA will protest at airports in major cities even if legislators manage to avoid another shutdown. On a joint website, the coalition cites contractor back-pay as a motivation for the protests. “A true general strike would take months of planning. But we cannot allow that to stop us from taking action now. We must do what we can immediately,” they write.